It disassembles into four pieces. A highly commendable driving range of up to 15.5 miles. The control system can be locked to prevent unauthorized use. The joystick is a little too sensitive for normal use, although it can be adjusted by a technician. The seat is quite small and will probably not be comfortable for a tall or heavy people. While the LiteRider GP-162 does have a few drawbacks the benefits far outweigh the limitations. 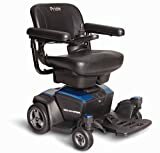 If portability and affordability are high on the list of what you require in an electric wheelchair then the LiteRider Envy GP-162 certainly satisfies on both counts. This wheelchair is very compact and easy to maneuver through tight spaces thus solving the problem of navigating through narrow halls and doorways. With a really tight turning radius of just 26” it can turn in its own “footprint,” making it really great for use in smaller homes or apartments. So the LiteRider Envy GP-162, a follow up model to the LiteRider Envy GP160, by Golden Technologies, is a great small, portable wheelchair. 1. With a lightweight tubular frame it disassembles into four pieces, the seat (22 lbs. ), the battery pack (25 lbs.) and the base which breaks down into two pieces, the transaxle (35 lbs.) and the front section (34 lbs.) for a total weight of 116 lbs. It can be easily be assembled and disassembled in a few minutes and can easily be carried in the trunk or on the rear seat of a car. 2. Beautifully designed with a weight capacity of 300 lbs., it has a top speed of 3.5 mph. 3. 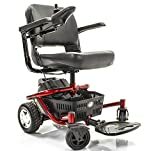 It comes with a comfortable, 17” x 16” stadium style seat, a spacious, under-seat plastic basket, non-scuffing 9” rear wheels and rear anti-tip wheels. 4. The two 22Ah 12V batteries give the wheelchair a highly commendable driving range of up to 15.5 miles. The batteries can be charged on-board or the battery pack may be removed from the wheelchair and plugged into a wall outlet, which can be very handy should you prefer to leave the chair in the trunk of your car and just recharge the batteries in your home or garage (4-6 hours). 5. The joystick/controller can be installed on the left or right armrest to suit your comfort preference. 6. The seat height can be adjusted through 2” – in 1” increments. 7. Via a sequence of key presses and joystick movements (as detailed in the user manual) the control system can be locked to prevent unauthorized use. 8. Also, and it is a feature that I have only seen in more expensive wheelchairs, it is possible to have a technician do a simple adjustment to customize “Tremor Dampening” which is sometimes used for those who may have an “upper body tremor.” With these new settings you would have to move the joystick with a more pronounced movement to get the unit to move forward, reverse or turn left or right. 9. Optional accessories include an oxygen tank holder, rear basket, cup holder etc. There is a five-year (limited) warranty on the frame, a 13-month (limited) warranty on the electronics and drive train and a one-year (limited) warranty on the batteries. One criticism I would have of the LiteRider Envy GP-162 is that the joystick is a little too sensitive for normal use and I feel if this issue could be resolved by the manufacturers it would vastly improve the product. However, it is possible to have the programming changed to adjust the sensitivity of the speed/touch of the joystick – it is a five-minute reprogramming operation but would have to be carried out by a local wheelchair technician. Although the LiteRider Envy GP-162 is a great model for in-home or traveling purposes it has a ground clearance of only 2.5” which will give a bumpy ride over grassy or rough terrain. Also, the seat is quite small and will probably not be comfortable for a tall or heavy people. Even for a person of normal height, the seat can get quite uncomfortable, especially for those who may be restricted to spending long hours sitting in a wheelchair. So, it’s important to keep these things in mind before making a final decision. In a nutshell, the LiteRider Envy GP-162 is a good model for indoor use and features great portability and comfort within an affordable price range. At a price of less than $1500, this wheelchair is a great model for the physically compromised.